Hello, everyone! I hope you’re all having a great first week of February. I love getting into this month and prepping all of my Valentine’s Day cards. Today I get to share a card I made for Your Next Stamp’s Valentine Series. The design team is all creating projects for Valentine’s Day! There have been a lot of fun projects already, and I have another one to show you today. For this card I really wanted to create a card that had a ton of the cute Your Next Stamp cats and dogs on it. I also really wanted to use some traditional Valentine’s Day colors. I started the card by ink blending Picked Raspberry Distress Oxide ink onto an A2 size card panel. Using a blender tool I made the color fade to the top in an ombre effect. I love this color, and it turned out so perfect. Next I took the small, solid heart from the new Carnival Food Fun stamp set and stamped it all over the panel. Sometimes I stamped directly on the panel and sometimes I stamped it off before putting it to the paper. This gave a variation of intensities. I also splattered the panel with some water. Next I die cut one of the So Many Squares Panel dies. I thought having all of the squares was going to be too busy (I already had a lot going on, and it was only going to get more crowded!) So I cut out the center squares with my scissors. I love that you could do this in a lot of different ways to make the die just what you need! I adhered it straight down to the ink blended panel. Next I stamped and colored a ton of the cats and dogs from COOL Cats, Paw-some Pups, and the Photo Booth stamp sets. I love all these critters separately, but together they are like their own little gang of friends 🙂 I stuck to the same two color combos using a cool gray and light tan Copic combo. I also made any of their collar etc. a bright pink. I trimmed everyone out, and arranged them how I wanted them on the card panel. To add just a little more detail, I drew in some white gel pen accents and then my card was complete! 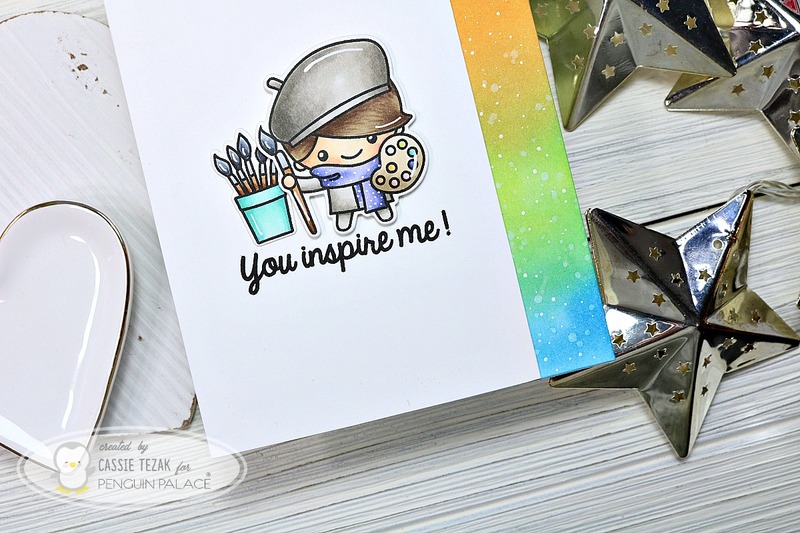 I hope you enjoyed this card I created for the Your Next Stamp Valentine’s Series! Be sure to keep an eye out for more projects from the rest of the design team 🙂 Thank you so much for stopping by and I’ll see you again soon with another card! Hello, everyone, and thanks for joining me today! It’s freezing where I live today, and I can’t seem to warm up. We’ve got the heat turned up and the blankets piled high! I hope you’re all staying warm today too 🙂 I’m back to share my second card in my mini Valentine’s Day series. I started today’s card by stamping the Gingham Backdrops pattern from Lawn Fawn with my Rockin’ Red ink from Catherine Pooler. I didn’t have to worry about lining the stamp up perfectly, because I knew I was going to be covering the middle-ish area with a strip of paper. Next I stamped out some of my fave pizza images from the Pizza My Heart stamp set with the Black Olive ink from Your Next Stamp. I used this ink because it’s my go to for Copic coloring as it doesn’t run or bleed. Next I colored the images up with some simple Copic combos and fussy cut them out. I stamped the peppers on the pizza with Eucalyptus ink, also from Catherine Pooler. I kept the Eucalyptus ink out and stamped the speech bubble from Heffy Doodle’s Whatcha Sayin’ stamp set, stamping the sentiment in black in, and die cutting it out. Next, I trimmed down a piece of 110 lb cardstock, and used the straight stitched line in Heffy Doodle’s Slopey Joes die set to give the edges a stitched look. Then I put together a sentiment from the Pizza My Heart set, using the Eucalyptus ink to highlight the part of it that was in a different font with some simple masking. Once all those steps were complete I just needed to put the card together and add some finishing touches! I added some white gel pen accents and made the pizza cutter nice and glossy with a thick coat of Glossy Accents. The stripe with all of the elements, as well as the speech bubble, were popped up with foam tape. And that’s it for the second card in my Valentine’s series! I hope you enjoyed it. What is it about making cards with food on them that always leaves me hungry?? I hope I’m not the only one! Thanks so much for stopping by today, and I’ll see you again soon with another card! The first card that I have to share was one of the first designs that came to mind when she asked me to make these. I started the card by stamping the lightbulb from the Turn Me On stamp set from Lawn Fawn. 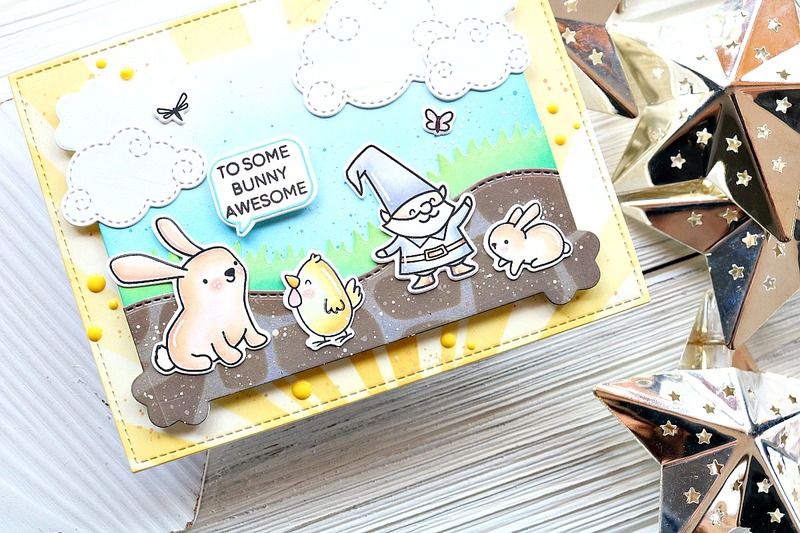 I used VersaMark ink and gold embossing powder to do some heat embossing. Then I ink blended some Worn Lipstick Distress Oxide ink over the card panel. I tried to keep it lighter in the center and darker on the edges. Once that was complete I splattered white and gold paint over the piece, making sure they were dry in between. It’s hard to see in the photos, but once the card was completely dry, I used a cool gray Copic marker to give shadows to each light bulb. 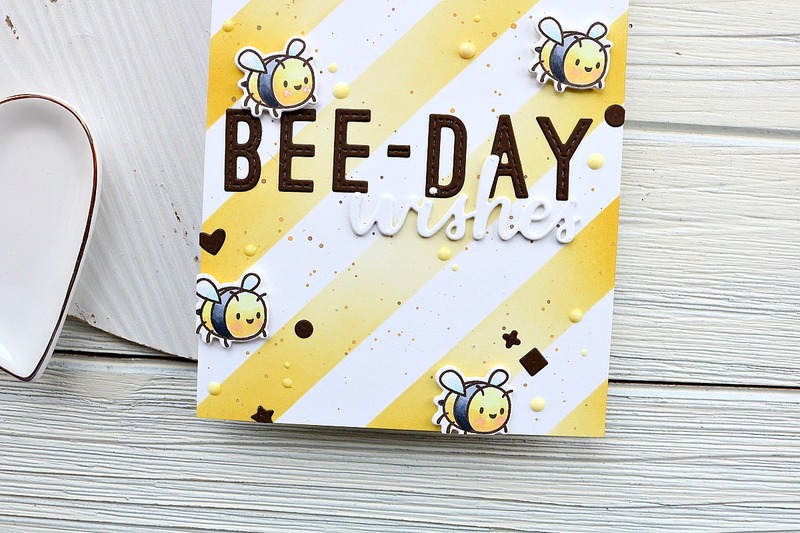 Once the panel was complete I used the Simple Alpha stamp set from Honey Bee to create my own sentiment. I stamped out the letters with more VersaMark ink onto some black cardstock. This time I used white embossing powder to heat emboss. I trimmed the piece down with my fave strip die: Strips of Ease from Heffy Doodle. The sentiment was attached with foam tape and that was it for my card! I hope you enjoyed this first card in the Valentine’s Day series 🙂 Thank you so much for stopping by, and I’ll see you again soon with another card! Today I’m sharing a Valentine’s Day card using Dino Time stamps and Dino Prints Dies! Hi, crafty friends, Cassie here! How are you all doing today? I’m doing great, because I’ve been in the craft room creating this cute Valentine’s Day card! It’s a pretty simple design that has some really fun details. Let’s jump right in. I started the card for today by stamping out all of the dinosaurs from Dino Time on some 110 lb card stock with Copic safe ink. Then, I colored them in with my favorite peachy pink combo: R32, R30, R00 and R000. I used some R08 and R30 for their cheeks. Each dino got some white highlights with my gel pen, and was die cut using the coordinating Dino Time dies. The next step was to create my die cut panel over lay. I took a piece of 110 lb cardstock that was cut to A2 size, and die cut the Dino Prints dies across the piece to look like footprints. Next, on another A2 size card panel, I ink blended Tattered Rose and Worn Lipstick Distress Ink. I had no real rhyme or reason to how I did this. The only thing I kept in mind was where the foot prints were cut so that I didn’t have harsh lines in those areas. If you notice, some footprint areas fade from color to color, some fade to white. I like the variation of them, but if you were looking for a more solid shape, you could ink blend the whole panel. I adhered the die cut panel over the ink blended one, and attached my dinosaurs with some adhesive to those pieces as well. I didn’t end up using them all, but the ones that I didn’t use were tucked in with the stamp set in case I can use them in the future. I also added some white dot details to each foot print area. Once everything was put together, all I had left to do was make my sentiment. I used a Copic marker to color a piece of card stock in a red shade and heat embossed one of the sentiments over the top with white embossing powder. To cut out the sentiment I used the smallest Stripes of Ease die and then attached it to the card using foam tape. And that’s it for my card today! I hope you enjoyed this cute Valentine. Have you started making your Valentine’s yet? It will be here before we know it! Thanks so much for stopping by today, and I’ll see you again soon!